Thanks to Iceland's volcanic ash cloud, we're again obsessed with vapor — clouds, mists, fogs, steam, chemical gas warfare, the miasma theory of disease — in fact, with just about any aerosolized matter like sandstorms, carcinogenic dust clouds of asbestos, crowd control tear gas, climate change smog and forests atomized through slash and burning. One could devote an entire blog just on this topic without running of material, as anything could probably be vaporized, given a thermonuclear bomb or a supernova or apparition lessons at Hogwarts. If one were indeed to start such a blog (perhaps called Pathological Aerology in imitation of the awesome Pathological Geomorphology), there definitely should be an entry on Juliet Haysom's Spring. 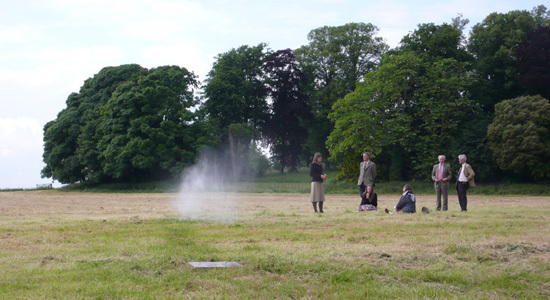 The proposal of which having won the Jerwood Sculpture Prize in 2007, Spring was permanently installed the following year at Ragley Hall, a stately country house near Stratford-upon-Avon in England. 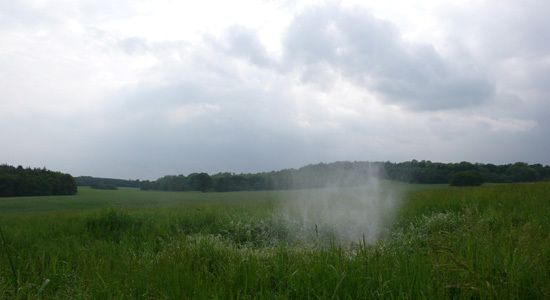 Researching my proposal for the Jerwood Sculpture Prize brief, I realized that Ragley Hall is situated above one of England's most significant aquifers. About 40 percent of Severn and Trent Water's supply comes from this vast subterranean water resource, as do the celebrated springs at nearby Malvern, Leamington Spa and Burton on Trent. 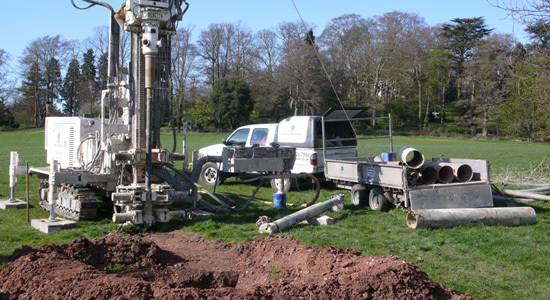 Rather than construct and import something into the park, my proposal involved drilling a borehole into the aquifer below the site. 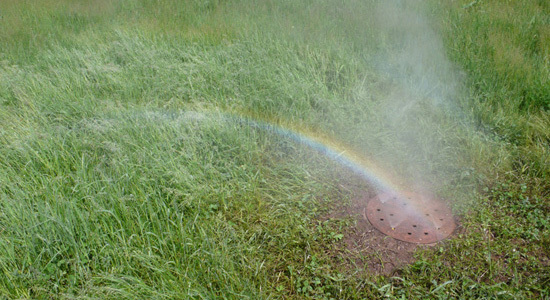 Water from the borehole would be then pumped to the surface where it would appear as a cloud of fine mist. Spring's external form and appearance will vary significantly depending on weather and light conditions. In other words, when early morning sunlight begins hitting the nearby solar panels that power the water pumps, the mist will slowly start to appear. At midday, the cloud will have expanded. When it's sunny, it will create a tower of mist, a sort of shimmering tree. If it's overcast or windy, however, its form will become tenuous, more spectral. If there's a rainstorm, then it will dissolve into the pouring rain. As evening approaches and the light dims, Spring will dull down until vanishing completely for the night. While at first glance Spring might look like a natural phenomenon, on close inspection the form of its jets and the presence of nearby solar panels will reveal the fact that it is a man-made intervention into the landscape. The parkland at Ragley Hall is similarly deceptive; its rolling hills, informal stands of trees and picturesque lake were, in fact, designed by Capability Brown. One of the towering figures of landscape architecture thus invoked, and along with him the monumentally rich history and traditions of garden design, it wouldn't be far off the mark to think Spring as a sort of avant-garde folly, a Greek temple vaporized and aerosolized against a sylvan backdrop to evoke the story of Jupiter and Io or the vaporous origins of the Centaurs. AMO is a design and research studio inside OMA, a think tank operating on the boundaries of architecture: media, politics, sociology, sustainability, technology, fashion, curating, publishing and graphic design. Some of their works include the barcode flag for the EU and a study for Wired magazine. And while OMA covers sustainable strategies on a building or master plan scale, AMO is approaching it on en European scale as one of the five consultants conducting technical, economic and policy analyses for Roadmap 2050, an initiative by the European Climate Foundation which looks to chart a policy roadmap for the next 5-10 years based on the European leaders’ commitment to an 80-95% reduction in CO2 emissions by 2050. You can download a brief of Roadmap 2050 in PDF. The goal is to achieve a 2% energy efficiency saving per year in order to meet this goal, with power and vehicle transportation being the most important areas. 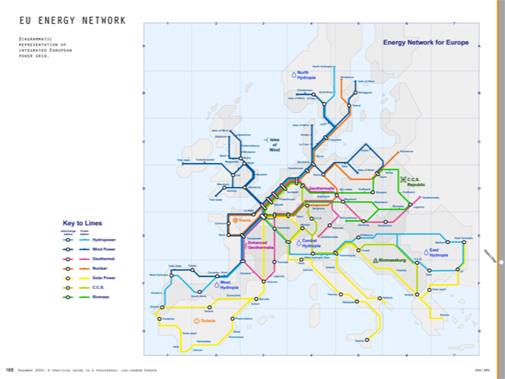 Through the complete integration and synchronization of the EU’s energy infrastructure, Europe can take maximum advantage of its geographical diversity. 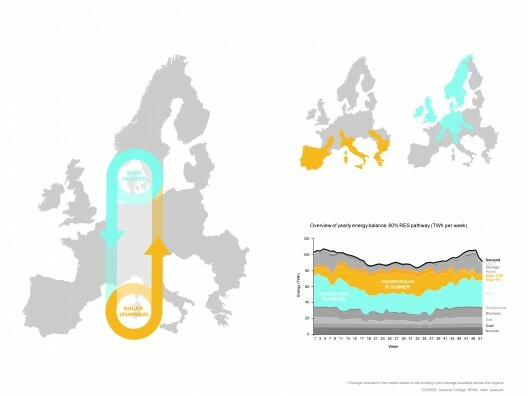 The report’s findings show that by 2050, the simultaneous presence of various renewable energy sources within the EU can create a complementary system of energy provision ensuring energy security for future generations. 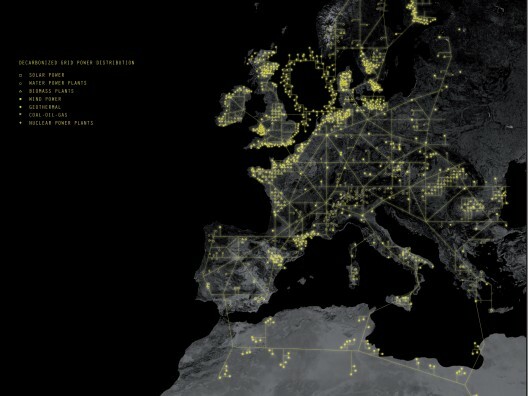 AMO’s work focuses on the production of a graphic narrative which conceptualizes and visualizes the geographic, political, and cultural implications of the integrated, decarbonized European power sector. On their study you can find an interesting approach to a diverse european energy grid, including energy trade and the use of new non-traditional sources. 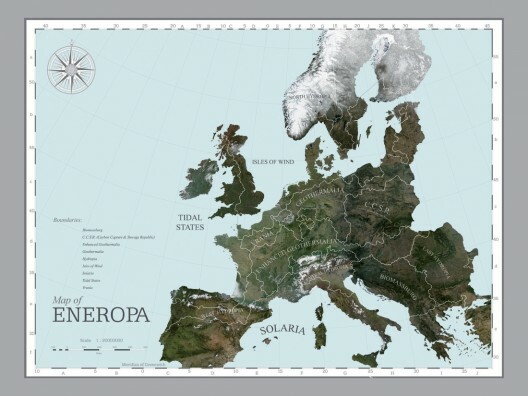 The image of “Eneropa” appears as a new continent based on its energy production: Biomassburg, Geothermalia, Solaria, the Tidal States… are part of this new territory. Other branding concepts are introduced on the study, creating a tangible image of this ambitious plan, which reminds the powerful (yet simple) idea behind the barcode flag. 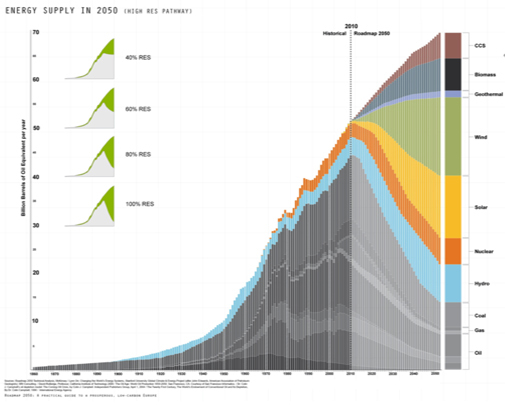 You can download the full study in PDF format at the Roadmap 2050 website. 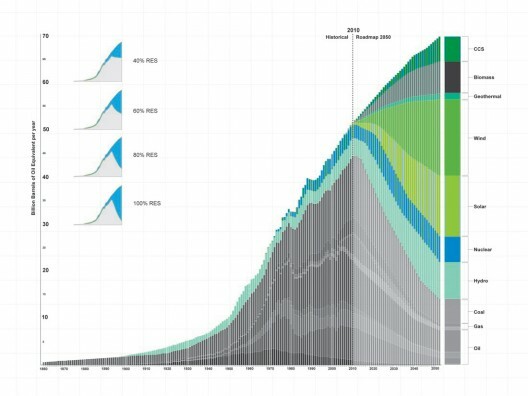 An interesting new report by AMO for Roadmap 2050 recently emerged online. 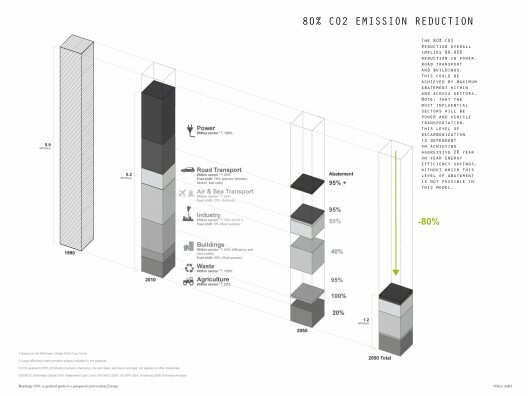 Roadmap 2050 is a policy roadmap to address the 80-95% reduction in CO2 emissions targeted by Europe for 2050. 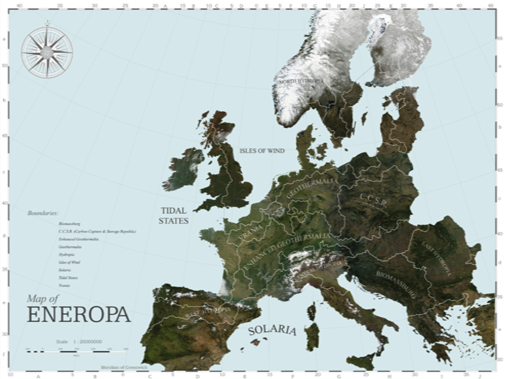 The AMO study creates a new image of Europe as Eneropa, a continent now defined by energy territories – Biomassburg, Geothermalia, Solaria, Isles of Wind, Tidal States, etc…. These new territories are connected by a new green grid, represented by AMO in a language akin to subway transit maps – isolating nodes of production and movement corridors for energy. While doing so, this new networked grid creates a legible structure of energy infrastructure which is displayed in various branding schemes. 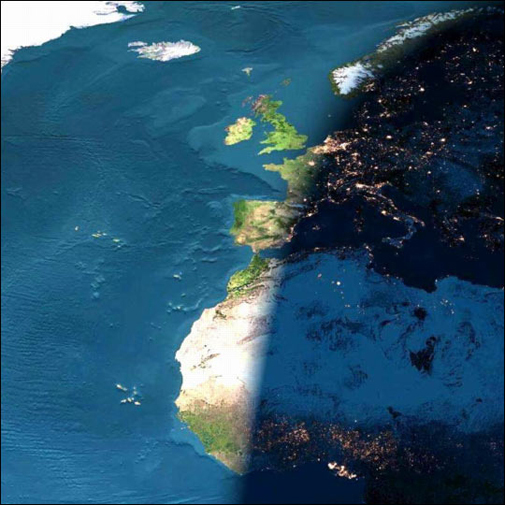 The report also discusses the possibility of an energy exchange with North Africa, utilizing the solar potential of North Africa in exchange for wind energy from Eneropa"""''s Isles of Wind. 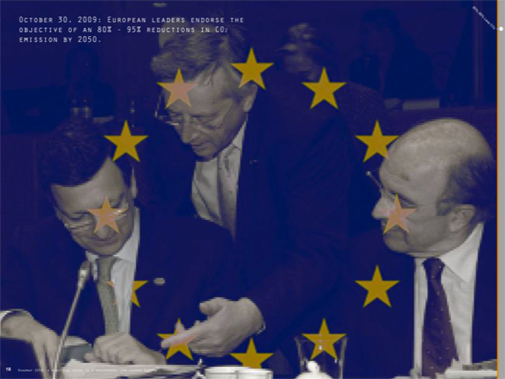 What would happen to the old energy infrastructure of Europe? The report suggests that this could be preserved as as Unesco Sites of the pre-Eneropa world. Perhaps as a memory/ reminder of the world reliant on carbon, these would be the monuments of a world enthralled with energy. And how much would this cost? AMO"""''s study estimates that the increased energy cost per household to live in a decarbonized Europe would only be 140 euros. The report also touches on some new energy initiatives and technological breakthroughs. You can access the Report PDF here. Intersting to see that "sustainable solutions" are taking advantage of geographic diversities. Answers seems to come at the scale of at least large regions or continents, taking differencies into account. Can we speak here about global sustainability, global differencies, maybe "networked miscegenation" or "networked mobility". These are themes that interest us for a while now and we see here a confirmation and a way to continue to go with those concepts in our work. 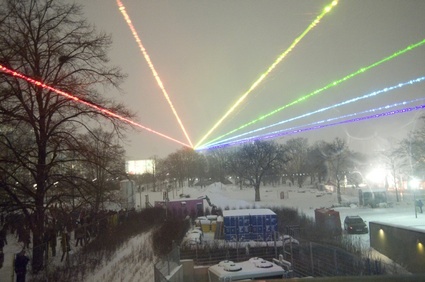 Yvette Mattern's stunning laser rainbow projection, From One To Many, blazed through Berlin's night sky over three evenings, enabling any Berliner devoid of a festival pass or even knowledge that the festival ever existed to enjoy the spectacle. 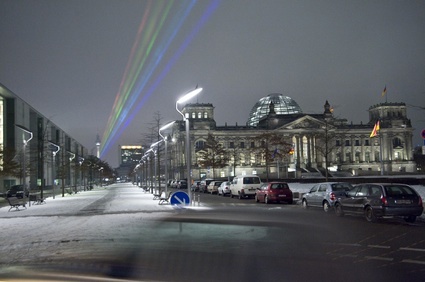 The rainbow rose diagonally from the roof of the Haus der Kulturen der Welt, crossed a distance of 3 km and reached to a point approximately 250 metres up the shaft of the Fernsehturm (TV tower) on Alexanderplatz. 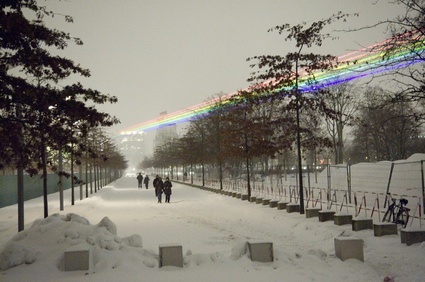 Another version of the project was shown a year ago in New York City, under the name Global Rainbow. The increasing speed that climate change is impacting our globe, coupled with slow transformations of lifestyle and policy to radically reduce GHG emissions, have prompted many climate change scientists to (re)consider Geoengineering, A.K.A planetary climate-engineering, to rapidly cool the earth. Levels of carbon dioxide in the atmosphere have surpassed 385 parts per million, rising above the limit of 350 parts per million that many scientists consider to be the threshold for maintaining a stable ‘natural’ climate. Despite the present interest in global warming, current studies reveal that we are still pumping more carbon dioxide into the atmosphere – approximately increasing the levels by 2 parts per million each year. Geoengineering – an option that was seldom considered viable, is now being acknowledged as a potential solution, or Plan B to climate change. One of the reasons for this (beyond the grim reality of carbon levels) is that geoengineering could potentially be very cheap. Many now argue that geoengineering is an economic alternative to ‘buy us time’ to develop zero-emission technology in a cost effective manner. While most scientists agree that the reduction of GHG emissions is the fundamental solution (Plan A), they also admit that geoengineering may one of the few options to address future climate change. Ronald Prinn, a professor of atmospheric science and the director of the Center for Global Change science at MIT, explains why climate scientists have started to change their minds about geoengineering in this video. Put simply, we have come too far and engineering our way out of this situation may be our only choice. For years, geoengineering techniques were only to be found in science-fiction novels, and not put on the table as possible options. Now, as geoengineering is being reconsidered, we realize how little we know about the atmosphere and climatic changes. This has already prompted research and a report on Geoengineering by the UK’s Royal Society, as well an American report, instigated in part by President Obama’s science advisor, John Holdren. Even the IPCC’s report touches on geoengineering in section 4.7, stating what many scientists firmly believe – geoengineering focuses on the symptoms rather than the cause. 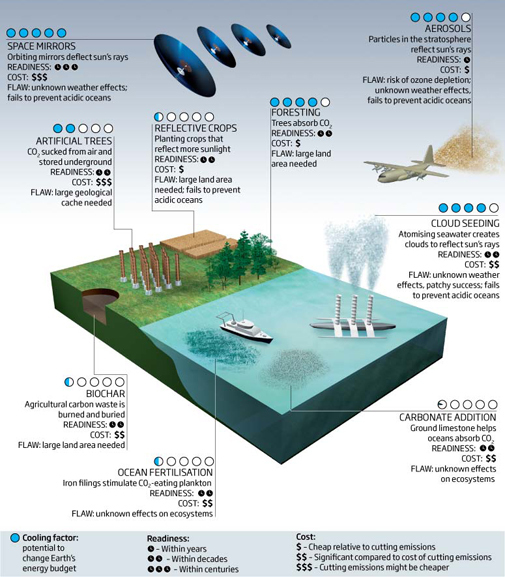 The purpose of this nascent research, however, is to wage the various options of geoengineering, understand how to implement them, and run models to gain insights on their potential side effects. There are several schemes currently being cooked up by scientists to geoengineer our climate that fall into two basic categories: (i) Solar Radiation Management and (ii) Mitigation techniques, such as carbon sequesterering. While several of these initial ideas are seemingly sci-fi in nature, they are becoming increasingly plausible solutions to address climate change. Step 1 is to understand atmospheric systems more precisely and Step 2 is to figure out how to manipulate this system. Solar Radiation Management could take several forms, but the basic premise of each strategy is the same: to block or reflect solar radiation out of the atmosphere. Proposals range from cloud seeding, to arctic ice harvesting (for its reflective quality) to large sun disks in outer space. The first notable proposal, which is still under investigation today, was by the Soviet Scientist, Mikhail Budyko in 1974. Budyko suggested the injection of gases into the upper reaches of the atmosphere would cool the earth. 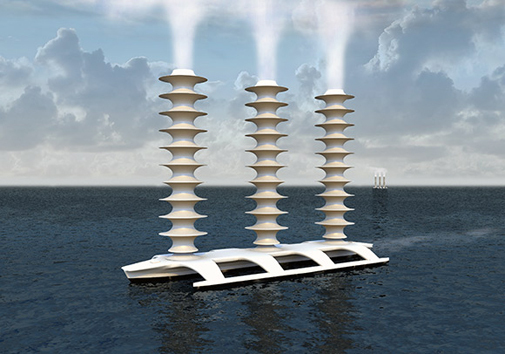 The idea is inspired by the natural phenomenon of volcanic eruptions or massive forest fires that send sulfur dioxide into the upper atmosphere where it acts as micro-deflectors of sunlight. Hovering 10 kilometers above the earth in the stratosphere, this sulfur not only reduces the amount of sunlight that hits the surface, it also creates a haze that diffuses the sunlight. 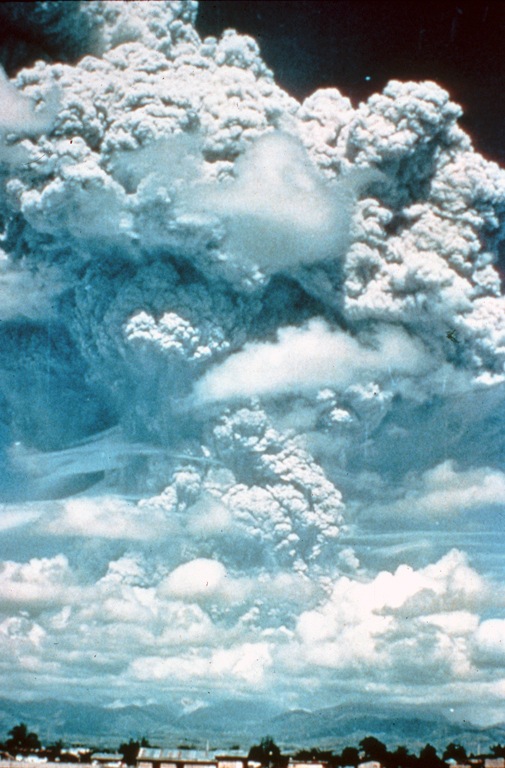 The most cited precedent for such an approach is the eruption of Mount Pinatubo (Philippines) in 1991, which released 15 million tons of sulfur dioxide into the stratosphere, and cooled average temperatures by half a degree Celcius. Current predictions estimate that between one and five million tons of sulfur would need to be injected into the stratosphere each year. From rockets filled with sulfur to hot air balloon smokestacks from coal-fired power plants, there are several options on how to actually get the sulfur into the stratosphere. One major issue with sulfur injections is that they do not address GHG emissions. In fact, they require a continual supply of sulfur dioxide in the atmosphere – and, as the earth is further heated – will always require more and more sulfur dioxide in future years. The economic and resource investment would be continually past down to future generations. Beyond the technical and unsustainable growth model of sulfur dioxide injections, scientists don’t know enough about atmospheric chemistry to predict exactly what will happen. Without percise climate models, there is little understanding on how this will affect rain, wind patterns and ocean currents. And simultaneously, climate modeling is our only choice – as it is difficult to test several ideas without impacting climatic systems. The unpredictable nature of the ensuing effects could be more disasterous than our current climatic crisis. 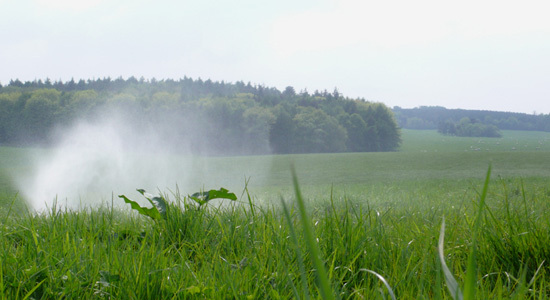 Others have noted that sulfate shields only work to block sun, and would therefore be less effective during the night and winter. This differential climate would have several large reaching effects on the world’s ecosystems and oceans. Oceans, in fact, would continue to acidify because the GHG’s would linger and build in the atmosphere. Other climate models show that sulfur sunshades could also create catastrophic droughts (droughts were noticed for a year after Mount Pinatubo’s eruption). 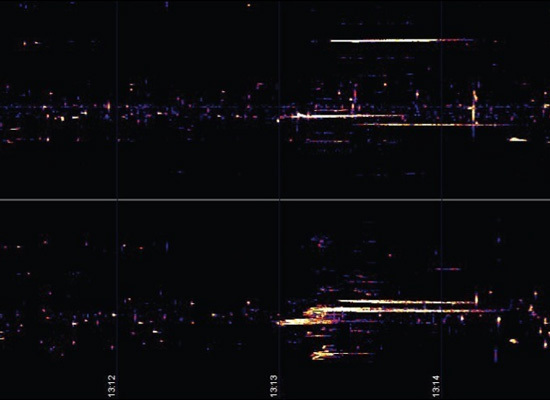 With so many variables and little precision in climate modeling, sulfur dioxide injections may pose more problems than solutions, especially because they are cheap. Mitigation Techniques include different forms of carbon capture and carbon sequestering. Three of the major strands of research here involve (i) Phytoplankton Storage (ii) Artificial Trees, and (iii) Geological Storage. 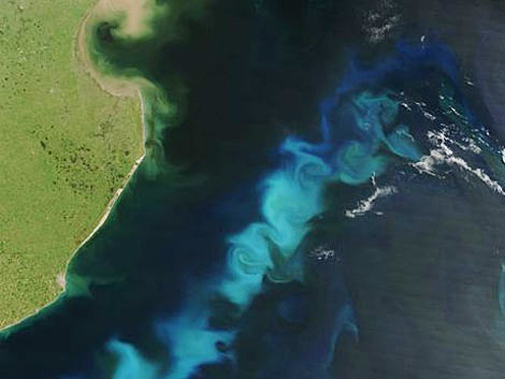 Phytoplankton consume large amounts of carbon dioxide during photosynthesis. Filling the seas with iron – a favorite of phytoplankton – would encourage blooms that would absorb large amounts of carbon dioxide and transport this to the bottom of the ocean. The dropping of massive quantities of iron into the ocean and promoting large scale phytoplankton production would have great repercussions on ocean ecosystems – repercussions that we cannot predict. Other materials that can capture and store large amounts of carbon dioxide are being explored to augment natural processes. One such trajectory of research is examining peridotite rocks, which form magnesium carbonate when they react with carbon dioxide. 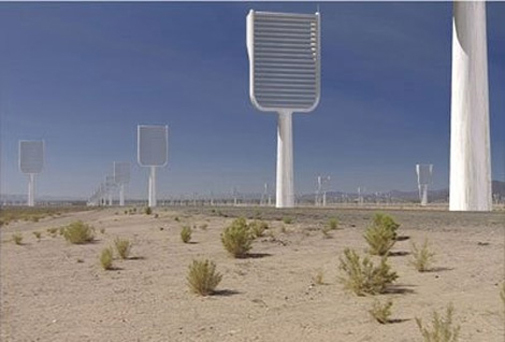 Others, such as Columbia University’s Klaus Lackner, are exploring the production of ‘artificial trees’. Lackner’s tree is able to capture a ton of carbon from the atmosphere each day. What are these ‘trees’ made of? For the most part, panels of an absorbent resin that react with carbon dioxide to form a solid. Lackner’s prototypes suggest that a 10m x 10m area of panels could extract 1,000 tons of carbon dioxide each year. 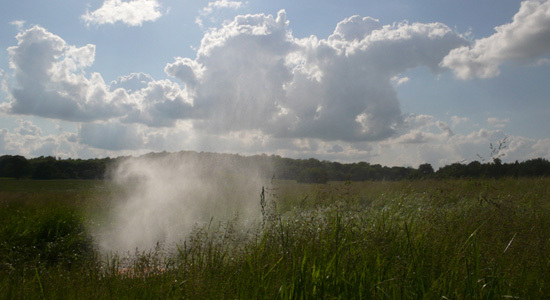 Once captured, these filters can be cleaned with steam. The largest issue with attempting to orchestrate a climatic transformation is that we just don’t know enough about how our atmosphere works and the repercussions of our tampering. Further, most geoengineering schemes require future generations to maintain such measures, with little end in sight. Geoengineering also poses a political issue, as any response would affect the entire globe. 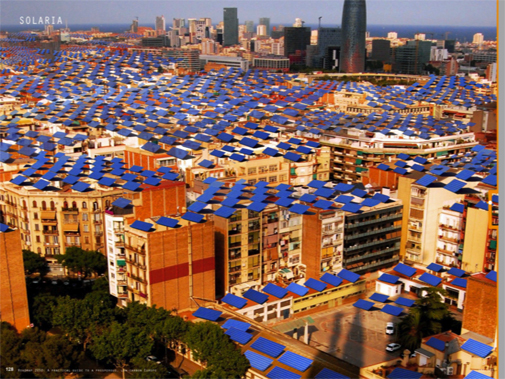 Because certain schemes, such as sulfate shading, are quite simple and relatively cheap to implement, they could be done by most nations, creating the seeds for future conflicts. Currently, no international laws or treaties would prevent a country from unilaterally beginning a geoengineering project. 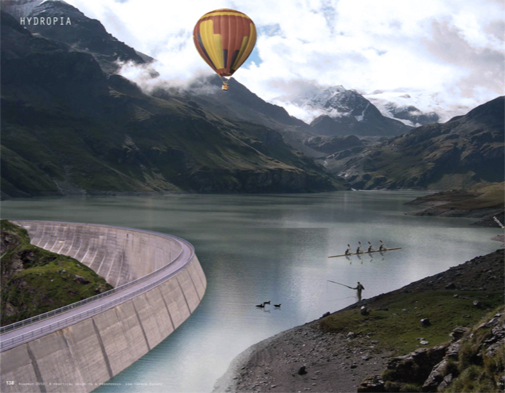 Who would monitor such projects, and who should have a say? The political administering of geoengineering is just as complex as some of the schemes. Another issue is a social one – the present energy on climate change initiatives may slow if there is a belief that we can always find new engineering solutions to address unsustainable practices. As it stands, the risks of geoengineering seem to outweigh any possible benefits. Some scientists predict that we are about 40 years away from understanding this technology. Once we do, Plan B may be less risky than doing nothing. A great discussion on Geoengineering took place a few weeks ago on TVO’s The Agenda. You can watch the episode here.